Any trip to Tokyo comes with lots of ramen. Tokyo Ramen Street is so central, and right next to the Shinkansen, so it's hard to stop anywhere else when I arrive. This time I tried ramen street newcomer Sora no Iro, an odd shop that prides itself on vegan ramen. I've rarely ever had this easy to mess up dish before, so I held my breath even though I had heard only good things. The look, the smell, everything about this is different from standard ramen, almost to the point of questioning if it is ramen. It had aromas of carrots and tomatoes, clearly main ingredients judging by the orange color of the soup. The thin broth tasted similarly, with some potato after-taste as well. The noodles were unique as well. They were made with udon flour and paprika, producing flat, reddish, elastic wheat. Let's not forget the mass of vegetables on top. There was cabbage, zucchini, and lotus root chips. Tomatoes, carrots, and yuzu pepper on the side. A creamy, tangy egg. It was very different from a bowl made from meat, but it was hearty and delicious, without leaving me needing a nap afterwards. 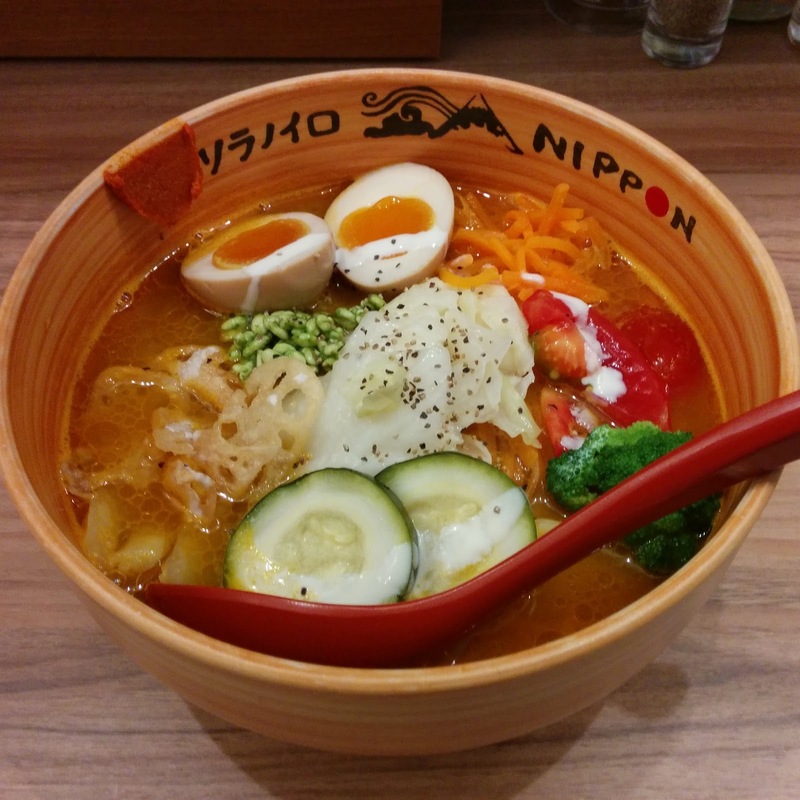 I'm actually surprised we don't see more ramen-ya serve a vegetable-based ramen bowl in Japan. Yeah, I'd be happy to try more, and it gives me something to talk about when I'm hanging out with vegetarians!